Good news, Planeswalker! Things didn’t exactly go according to plan on Ixalan, but you didn’t die and now you have time to regroup. There’s no better place than Dominaria, the setting for many of the early adventures that shaped the Multiverse. It’s only fitting than as we celebrate 25 years of our favorite game, we head back to where it all began. Dominaria is a plane of legend, filled with friends, foes, and fables both familiar and foreign. Let’s check out all the new mechanics you’ll encounter as past and present collide in our journey back to Dominaria. Stories are as much a part of Dominaria’s landscape as the mountains of Keld. Stories of war, stories of invasion, stories of famous siblings . . . Dominaria has them all. Saga is a new enchantment type that captures some of those stories in episodic form. They’re unlike anything you’ve ever seen, unless you’re from the future, which, you know . . . wouldn’t be that strange here. Every Saga has three chapters, represented by the I, II, and III symbols. Each chapter also has a corresponding effect. For The Flame of Keld, we see that the effect of chapter I is “Discard your hand.” The story gets better, I promise. Some Sagas have the same effect for multiple chapters. Instead of that effect being listed more than once, you’ll notice that the chapter symbols are just grouped together with the appropriate effect. The specifics of how and when those effects happen all revolve around lore counters. Sagas enter the battlefield with a lore counter. Once a Saga is on the battlefield, you’ll add a lore counter to it as your first main phase begins. Adding a lore counter in this way doesn’t use the stack. That part just happens after your draw step, before you can cast any creatures, sorceries, and the like. Why are lore counters important? Each combination of chapter symbol and effect is a triggered ability. When a lore counter is added to a Saga, look at the new number of lore counters it has. The chapter ability matching that new number will trigger. After the last chapter ability has left the stack, you’ll sacrifice the Saga. 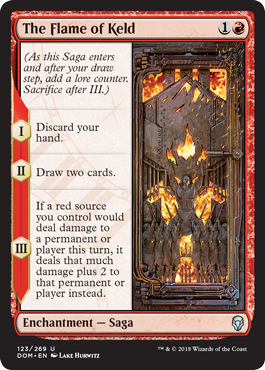 For all the Sagas in Dominaria, that’s chapter III. Most often, the ability leaves the stack because it resolved, but sometimes it’ll be countered or leave the stack in some other way. No matter how it happens, as soon as that last chapter ability isn’t on the stack, you sacrifice the Saga immediately as a state-based action. Let’s see that in action. Well, let’s read about it in action. The Flame of Keld enters the battlefield with a lore counter, so its chapter I ability triggers. You’ll discard your hand when that ability resolves. Most likely, The Flame of Keld entered the battlefield during your main phase, so that’s all that happens with it on that turn. On your next turn, as your first main phase begins, you put a lore counter on The Flame of Keld. It now has two lore counters, so its chapter II ability triggers. You draw two cards as that ability resolves. (See? I told you the story got better.) On your following turn, you’ll put a third lore counter on The Flame of Keld and you’ll enjoy a whole turn of increased damage. I hope you planned for that. After that ability resolves, you sacrifice The Flame of Keld. Poetic. Adding the lore counters as your first main phase begins is mandatory. You can’t opt to not do it to stretch out the story. Remember that while adding the lore counters doesn’t use the stack, the chapter ability does, so it can be responded to. Once a chapter ability triggers, adding or removing lore counters on the Saga won’t affect that ability. If you find a way to remove a lore counter from a Saga, that doesn’t cause any of its abilities to trigger. However, you may get to repeat a chapter the next time you put a lore counter on it. That is, going from two lore counters to one won’t cause the chapter I ability to retrigger, but it will let you get the chapter II ability again later on. In some unusual cases, you might add more than one lore counter to a Saga simultaneously. This can happen with effects like the one on Doubling Season. If that happens, take note of what chapter you started on and where you end up. Each ability in between, including the one where you end up, will trigger. For example, if The Flame of Keld enters the battlefield while you control Doubling Season, it will enter with two lore counters. This will cause the chapter I and II abilities to trigger, and you can actually put them on the stack in either order. (Of course, I wouldn’t recommend drawing two cards before discarding your hand, but you do you.) The following turn, you’ll add another lore counter. (Note that Doubling Season won’t affect this turn-based action). The chapter III ability will then trigger. After that ability leaves the stack, you’ll sacrifice The Flame of Keld. And with that, the story on Sagas comes to a close. You’re visiting Dominaria at a fascinating time. After a seemingly endless stream of planar disasters, it’s bouncing back in a big way. Many of the sites, relics, and even the people are familiar, but there’s also a new generation of leaders and new destinies to forge. To celebrate it all, we’re introducing a new game term: historic. Historic is a way to collectively refer to artifacts, anything with the supertype legendary, and Sagas. 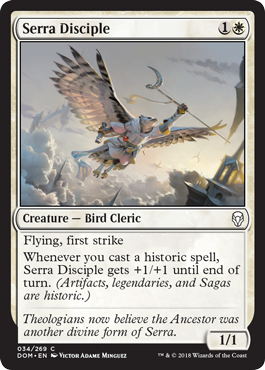 If an ability refers to casting a historic spell, like Serra Disciple above does, it means whenever you cast an artifact spell, cast a legendary spell, or cast a Saga. Playing a legendary land (or an artifact land) won’t cause those abilities to trigger because lands are never spells. 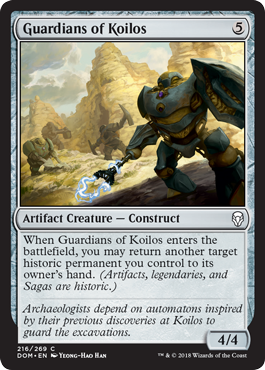 However, legendary lands are historic, so you can return them to your hand with Guardians of Koilos. Can you kick it? Yes you can, because kicker is back. One of the most popular abilities we’ve ever designed, kicker gives your cards a little flexibility. Simply put, pay more to get more. Kicker is an optional additional cost. 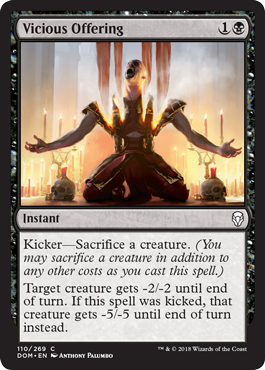 As you cast a spell with kicker, you choose whether you’re just paying the mana cost to get the spell’s normal effects. If you have the mana available, you can choose to kick the spell, paying the mana cost and the kicker cost. This will make the card better in some way. There are actually several different variations of kicker cards. Let’s take a look. 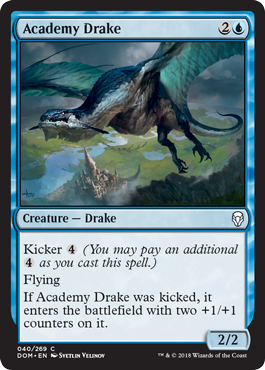 Academy Drake and cards like it are pretty simple. If you cast it for 2U, you get a 2/2 flier. Not bad. If it’s late in the game and you need a Drake of more impact, pay 6U and a 4/4 flier is yours to smash with. Kicker costs can be paid a maximum of one time. You can’t pay 4 repeatedly to get more and more +1/+1 counters. 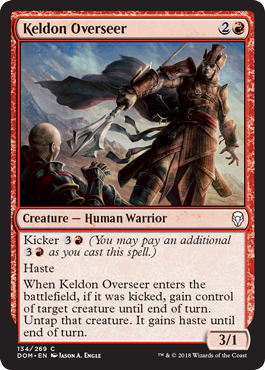 Some creatures with kicker, like Keldon Overseer, have enters-the-battlefield triggered abilities that trigger if the spell was kicked. If you chose to not kick Keldon Overseer, you still get the creature, but the ability won’t trigger. Instants and sorceries can also have kicker. Kicking an instant or sorcery may give you an additional effect. 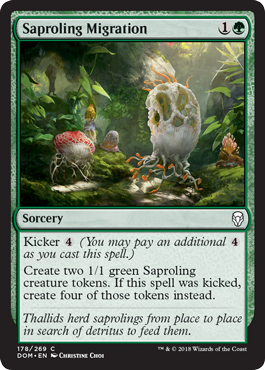 On some cards, like Saproling Migration, kicking it will give you an upgraded effect. Look for the word “instead” to signal when you’re getting a replacement effect as opposed to an additional effect. Kicker costs can include things other than mana payments. For Vicious Offering, you’ll have to sacrifice a creature. (May I suggest kicking Keldon Overseer first and sacrificing one you borrowed?) All kicker costs are paid at the same time as the spell’s other costs—as you’re announcing the spell, before anyone can respond. If Vicious Offering is countered, you don’t get your creature back, just like you don’t get your mana back. You can’t roam around Dominaria for too long without realizing that this place is all about legends. And its eponymous set is all about the supertype legendary. Permanents have enjoyed the legendary treatment for years. With this set, we thought it was time to let sorceries in on the fun. 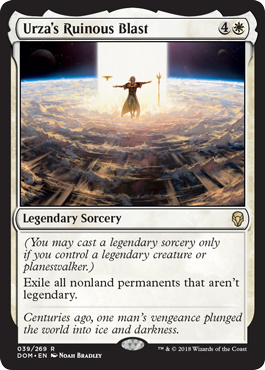 Dominaria includes—for the first time ever—legendary sorceries. The traditional definition of legendary deals with permanents players control. Sorceries are never on the battlefield, so what does a legendary sorcery mean? For starters, excitement. Scope out Urza’s Ruinous Blast. You can cast a legendary sorcery only if you control a legendary creature or planeswalker. Once you’ve cast a legendary sorcery, it doesn’t matter what happens to that creature or planeswalker. You need one around only to cast the spell. Other than needing a little help to cast it, there are no other restrictions on legendary sorceries. You can cast as many as you want in a turn, even ones with the same name. You probably noticed the slick new frame that appears on legendary cards, including the new legendary sorceries. This frame update makes spotting these historic cards even easier. You can learn more about this new frame and other changes we’ve made to Magic cards in Aaron Forsythe’s article here. HEXPROOF FROM . . .
Dominaria introduces a twist on an existing mechanic: hexproof. Allow me to introduce the esteemed Knight of Grace. A Knight of noble lineage, Knight of Grace harkens back to an earlier era and the hallowed White Knight. Hexproof from black means that Knight of Grace can’t be the target of any black spells an opponent controls. It also can’t be the target of any abilities of black sources an opponent controls. Spells and abilities that don’t target can still affect Knight of Grace. 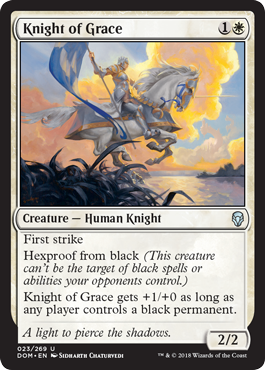 For example, if a black spell said “All creatures get -5/-5,” that effect would apply to Knight of Grace and likely have it heading to the graveyard. Whether this is your 25th day or your 25th year playing Magic, Dominaria is a celebration of all that Magic was and all it will be. Learn from the stories here. Connect with the legendary allies you encounter. Discover new weapons and prepare to fight. The horns of a familiar nemesis loom on the horizon.